The 3.6L Pentastar V6 can provide up to 295 horsepower to the Dodge Durango. That doesn't mean that you have to give up on fuel economy either. A full tank of gas can get you up to 600 miles before you need to refuel. It's no surprise that the V6 is ranked best-in-class for standard highway fuel economy. 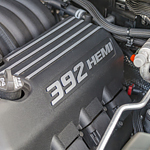 If you need additional power, the available 5.7L HEMI V8 puts out up to 360 horsepower. It utilizes a fuel-saving feature that can turn off four of the cylinders automatically when you don't need the additional power to provide up to 22 mpg highway fuel efficiency.